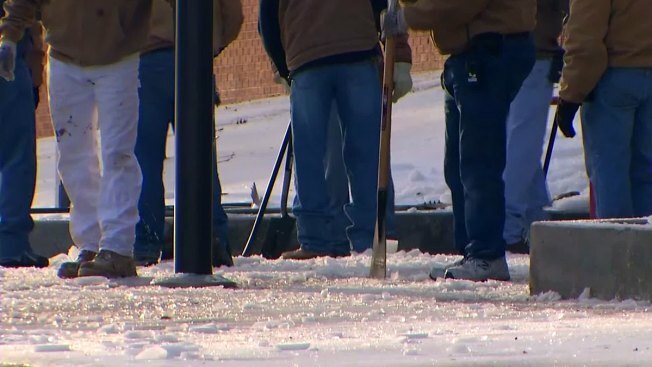 Work crews break up ice on a sidewalk. The winter storm that left a swath of Texas coated in ice last week is expected to cost Tarrant County $500,000. Tarrant County Judge Glen Whitley estimated the total cost Wednesday at the annual State of County event. In his figure, Whitley included manpower overtime, sand, salt and other measures used to free the county from the ice. The Fort Worth Star-Telegram reports that Whitley said county crews worked at least 2,000 additional overtime hours on the storm that started last Thursday. He said they had spread about 700 tons of sand and 10 tons of salt on roadways. The Fort Worth City Council was told Tuesday that the city had spent about $200,000, dumping more than 2,000 tons of sand.